If you’re a van driver in London then chances are you’ll already have heard of the ULEZ – Ultra Low Emission Zone – being brought into effect on 8th April 2019. For drivers in other regions, it’s worth knowing the facts to avoid getting hit by big penalties if you head into the capital next year – because although the ULEZ London targets a wide range of polluting vehicles, it’s van drivers who are going to bear the brunt of the levy. What is a ULEZ and why do we need one? A ULEZ pretty much lives up to its name – it’s a designated area where vehicles will be expected to meet tighter, much more stringent emissions standards, or else pay a daily fee in order to enter the area. The zone is being introduced by London Mayor Sadiq Khan in response to research stating that air quality in the capital consistently fails to meet global standards. Around half of the noxious chemicals in the air above London come from transport fumes, and can exacerbate existing conditions as well as shorten life expectancy and endanger normal lung development in children. What London areas will be ULEZ? 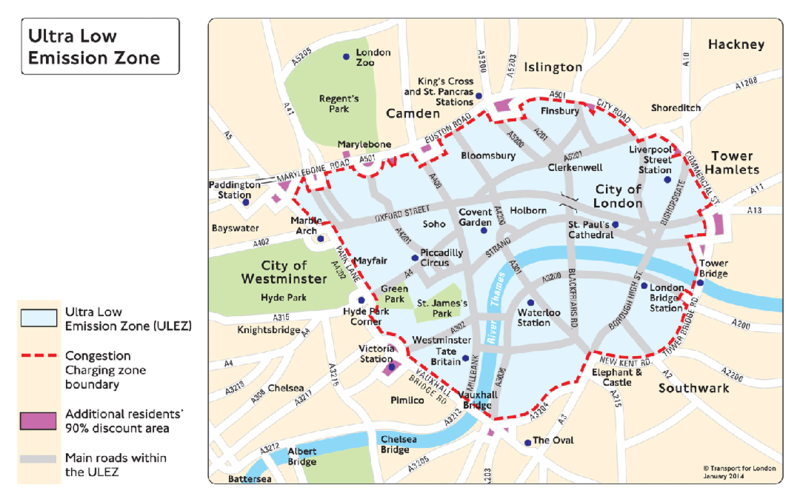 The new ULEZ zone in London will effectively replace the area currently covered by the T-Charge, which centres on the City of London and surrounding wards. Like the T-Charge, it will operate 24 hours a day, 365 days of the year, including weekends and public holidays. Signs will be placed in and around London to warn drivers that they are entering a ULEZ, but there won’t be any toll booths – ANPR cameras will register your vehicle details and check them against a database to ascertain if they meet the required standards. Furthermore, from October 2021 the ULEZ will be extended to include inner areas of London bounded by the North and South Circular routes – though vehicles using the Circular routes without actually entering the ULEZ won’t be charged. How will my van be affected? Any van entering the ULEZ will be checked to see if it meets the specification for emissions. If it does, then nothing will happen. If it doesn’t, then you’ll be expected to pay the daily charge – and if you don’t, you’ll be issued with a PCN (Penalty Charge Notice) for costs covering any days you used the ULEZ. Here’s a handy guide from the Transport for London website outlining the current charges and how they compare to the ULEZ charges being brought in: ULEZ Charges. Vans are likely to be worst affected by the changes due to the sheer volume of vans using central London. As most of the zone is commercial not residential, there are always fewer personal vehicles on the roads than normal, and the narrow, convoluted layout of the road network means that access for HGVs is not always guaranteed; therefore, the van provides easy access as well as space to transport goods, making it a vital aspect of delivering to and driving around the centre of London. It’s worth pointing out, though, that not only vans will be affected. If you drive any vehicle – including public service vehicles like London buses, gritters, emergency service vehicles and bin lorries – you’ll be expected to meet the emissions target or pay up. How do I know if my van is ULEZ compliant? The basic rule to follow for ULEZ compliance is that van emissions need to be to Euro 6 standards for diesel models and Euro 4 for petrol models. HGVs need to meet Euro VI in order to comply. To help you work out the specifics of if and how your van will meet London’s new, stricter emissions standards you can enter your registration number through the Government’s ULEZ Vehicle Checker or, if your van is not registered in the UK, then TfL have produced a handy table which gives general guidance. Please remember that vans which currently meet the requirements for LEZs may not meet those of the ULEZ so always double check before you get behind the wheel. If you currently live and drive in London and receive a Congestion Charge Discount, you will be eligible for a 100% discount on the ULEZ charge until 24 October 2021, by which time you will be expected to have acquired a vehicle which meets the new, lower emissions standards. During this discount phase, residents will still be expected to pay 90% of the current T-Charge.